Woohoo, another quotation-marked dish for our Weekend Wokking entry! 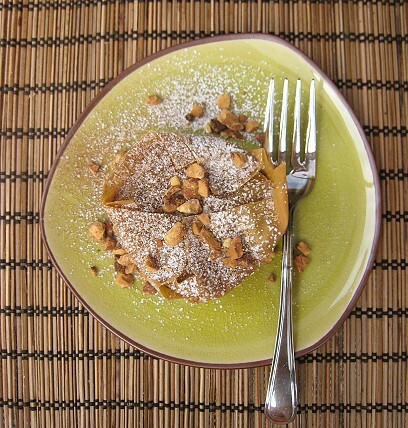 For our ALMOND dish, we wanted something that would utilize the nut in its various forms. JS suggested a baba ganoush, but with almond butter instead of tahini, and ground almonds in place of pine nuts. We later discovered that she suggested baba ganoush because she thought the ingredient was eggplant! Anyway, the baba ganoush was a promising idea. But, are we to simply make baba ganoush and call it a day? Are we not using almonds in other forms besides grounding them? Since we were on a Mediterranean route, we thought of phyllo. We can use the baba ganoush as a filling. This reminded us of bisteeya. How are we to make this phyllo-wrapped baba ganoush more bisteeya-ish? Well, using turmeric, for one. Adding eggs to the filling, for another. And of course, cinnamon sugar! Well, ok then. 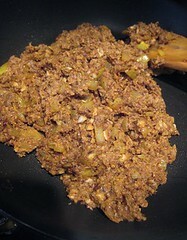 We'll have an almond-eggplant filling for our "bisteeya", using almond butter and ground almonds. To incorporate yet another form of almond, we can make almond milk and just think of a way to incorporate that into our entry somehow. Of course, we start with the almond. I roasted whole almonds and afterwards, ground them in the food processor. I took out about half of them, setting those aside, and proceeded to buzz the rest, adding a touch of olive oil, until they became almond butter. 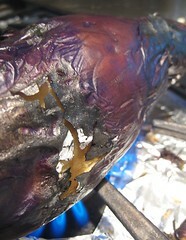 Anyway, in the meantime, I also charred an eggplant until black. I threw it onto a plate and covered it with plastic wrap to let it steam, then I peeled it and and set the now-mushy eggplant aside. I must say, the charring eggplant smelled like someone was smoking cigarettes! We were a little -- actually, a lot -- scared of its cigarette-smoke aroma. To make the "baba ganoush", I added the eggplant to the almond butter in the food processor, then added lemon juice, garlic and olive oil, seasoning with salt and pepper. 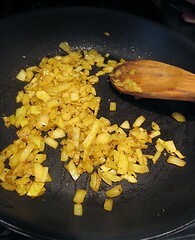 I started by sautéing some onions with some turmeric. Next, I added the "baba ganoush" mixture and cooked until it was warmed through. To make this more bisteeya-ish, I added a couple eggs over low heat and stirred until combined and the egg was starting to set. I then added the rest of the ground almonds. Time to stuff some phyllo! Um, all right. We didn't actually have phyllo pastry. We had the opportunity THREE TIMES to buy the phyllo, but we forgot to do so EACH TIME. When I was almost done with the filling, our laziness only permitted us to consider going to the nearest supermarket which only carried whole wheat phyllo pastry. We've tried it before, and really, it was no match for regular phyllo. We did happen to have some wonton skins in the fridge, so we decided to go with that. Another confession: I didn't melt butter for this! I used PAM! PAM! Shoot me now. Let's proceed. Just remember, pretend I melted some butter and used that, okay? I sprayed a muffin pan with PAM, and lined each indentation with 3 wonton skins (making sure to spray each skin). I filled it with my "baba ganoush" and finished it with cinnamon sugar. I placed one more PAM-sprayed (aka "butter-brushed") wonton skin on top, and folded over the overhanging wonton skins to close. I sprinkled the top with more cinnamon sugar. Into a 350F oven they went until the skins were golden brown, about 15 to 20 minutes. Let cool slightly, then add more cinnamon sugar. Or, sprinkle the top with confectioner's sugar. More ground almonds would be very good too. The end result? Flaky pastry -- OK, it should have been flaky pastry in theory, but ours wasn't that flaky because of our chronic affliction. 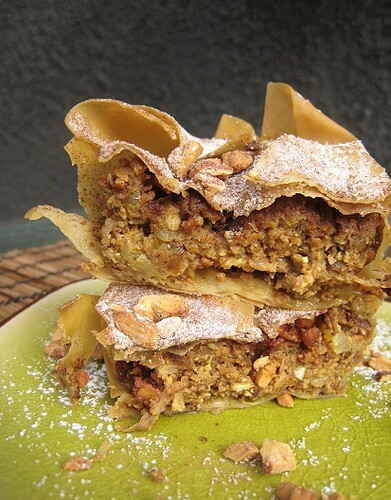 But of course you'll make yours wth phyllo, right? The end result was "flaky pastry" with a filling that's nutty and eggy, with a hint of smoke from the charred eggplants that was actually quite welcome in this context. Oh, take a look inside! The savoury-sweet-eggy-nutty taste sensations actually reminded me of our Fujian (Hokkien) lumpia -- which, now that I'm thinking about it, using the same wonton-cup concept, would have been a great entry for Weekend Wokking. Maybe next time, then. Our Fujian lumpia -- or should I call it lumpia "bisteeya"? Teehee. -- should definitely make an appearance soon. This Almond Eggplant "Bisteeya" makes for a great snack, appetizer, or breakfast. And speaking of breakfast, please have it with some Caffè Latte made with Almond Milk. Roast the almonds in a dry pan until golden-brown and fragrant. Alternatively, roast the almonds in a single layer in a 350F oven. Let cool. Then, chop the roasted almonds (or process in a food processor). Set aside. Char the eggplant on top of an open flame until black. Place in a brown paper bag and seal. (Or, place on a plate and cover with plastic wrap.) 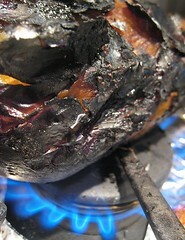 After a few minutes, peel charred eggplant. 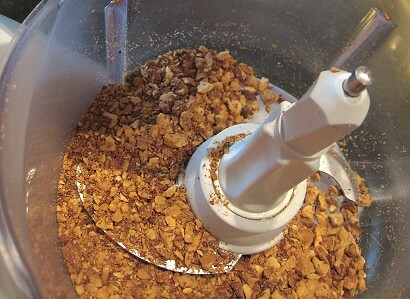 In a food processor, add about half of your ground almonds and 1 tablespoon olive oil. Process until the mixture becomes a paste (almond butter). Then, add your eggplant, garlic, and lemon zest and juice. Season with salt and pepper to taste. In a small saucepan, heat olive oil over medium/medium-low heat. 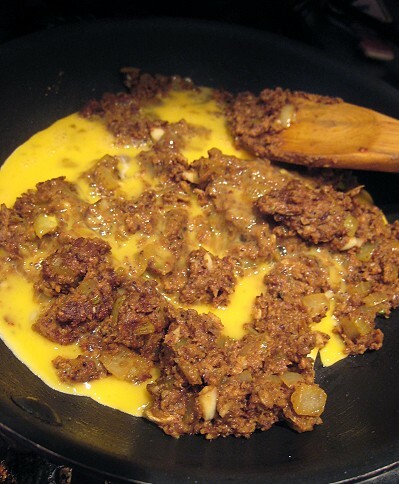 Add diced onions and turmeric and cook until the onions have softened. Add the "baba ganoush" and mix well and until heated through. Lower heat and add beaten eggs. Mix well and cook until the eggs are just starting to set. Add the rest of your ground almonds. Adjust seasoning as desired. Set aside. Mix the sugar with ground cinnamon. Set aside. 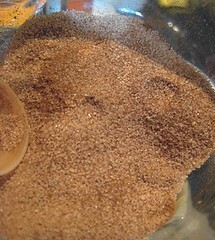 If you wish, you can make extra cinnamon sugar to serve with the finished product. Cut your phyllo pastry to size, making sure each piece is slightly larger than each "cup" in your muffin pan. 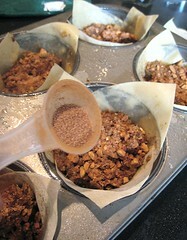 In a 6-"cup" muffin pan, brush each "cup" with melted butter. Place a sheet of phyllo, making sure it overhangs. Brush melted butter on the phyllo sheet in the "cup" and place another layer of phyllo. Brush with butter and repeat layers. Make about 7 layers, making sure the "cup" is well-covered. 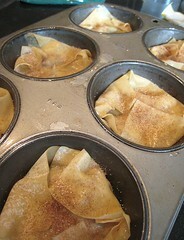 Divide your filling into the 6 "cups", then add about 1 teaspoon of cinnamon sugar in each cup. Fold over the overhanging phyllo, making sure to brush melted butter between layers, and sprinkle with more cinnamon sugar if desired. Bake until the phyllo is golden brown, about 15 to 20 minutes. 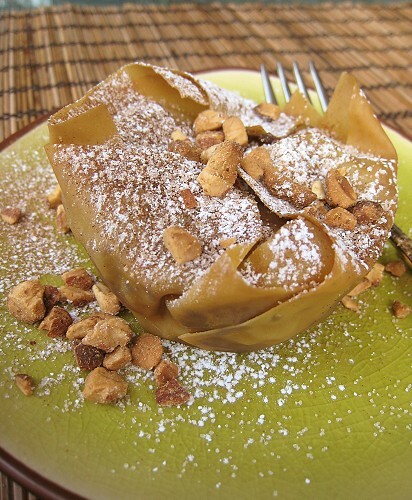 Each Almond Eggplant "Bisteeya" can be garnished with confectioner's sugar and ground almonds. 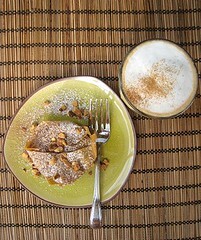 Serve with extra cinnamon sugar. Great with Caffè Latte made with Almond Milk. First off, this is a completely new dish to me and I'm not sure if it's supposed to be sweet or savory, probably a little of both, but it sounds nonetheless tasty. I'm intrigued. ...WHATever! The end result looks delicious. What a dish. I love reading about how you got to it 7 all the issues along the way. That looks gorgeous. I love the inventive wonton cup/phyllo. I had a chicken bastilla once and it was so weird to eat something that looked and tasted like dessert, yet it was chicken! That looks good. I have been wanting to try a bastilla. We like to mess around with sweet/savory. ;) Almond ice cream would be nice. 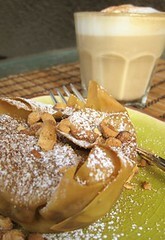 Although, being lazy as I am, I would just add almond butter and ground almonds into a milk custard. Haha, then I wonder what you'll think of the Fukien lumpia. I tell you, I really shower mine with the peanut-sugar! Can't wait to see one on your blog!